After my first wreck dive at Kogyo Maru, I was stoked! 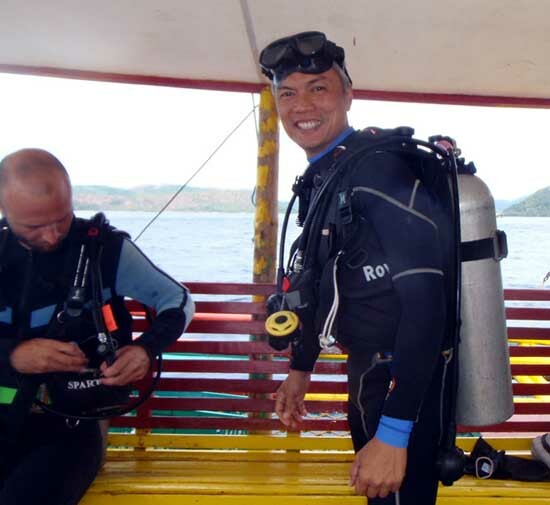 Time for another wreck dive while I'm still here in Coron, the wreck capital of the Philippines. I heard good things about another dive shop, Rocksteady Dive Center. I checked it out. Immediately, I noticed they cost marginally more. 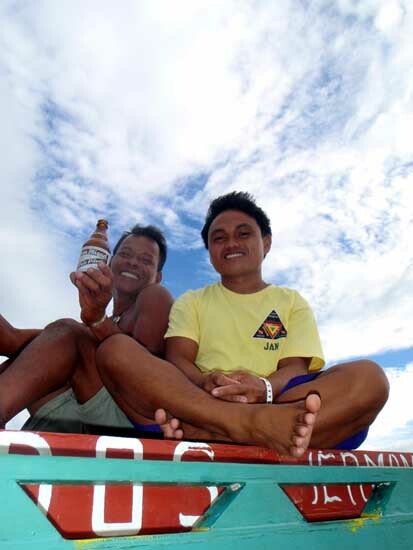 The cheapest in town was P2,000/2 dives. They were charging P2700/2 dives. I asked, "Why would I dive here if it's more money and it's the same wreck?". The immediate and take-it-or-leave-it reply was, "You get what you pay for." Hmmmm. Curious, I signed-up to see what it's all about. Immediately, I noticed the difference. 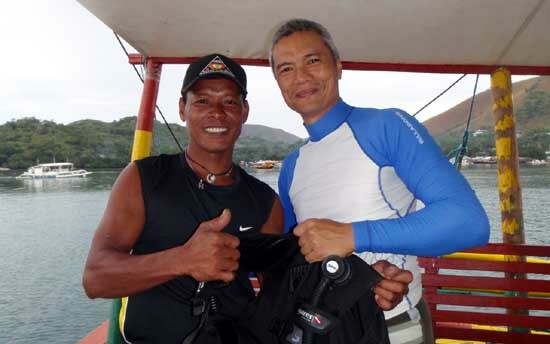 I was fitted with the equipment a day before to minimize dive-day delay. Nice! My gear was put into one crate that was for me alone - not mixed up with other's. Nice! On dive day itself, I was assigned one divemaster all for myself. Another nice! Dive groups were small and grouped according to diver skill level. While decompressing at 3m after a dive, I also noticed a tank and regulator on standby at that depth just in case anyone was running low on air - super nice! Included lunch was plenty and appetizing. The dive went well with no equipment issues - unlike the discomforting experience I had with a different dive shop. Yeah, you get what you pay for. 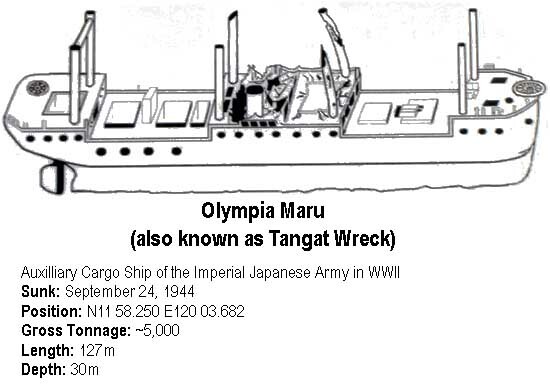 The Olympia Maru is a 127m Japanese cargo ship sunk in 1944 and lies upright 30m deep. There are many entry points that allow deep penetration into the wreck. Light from above streams through allowing for greater visibility. The cargo holds are spacious and gave a sense of flight. Unlike being on a reef where there is open expanse, being in a cargo hold where you see the confining floor, walls and ceiling...and you find yourself floating in the middle of it...is trippy! The hull is covered with hard corals with abundant marine life. 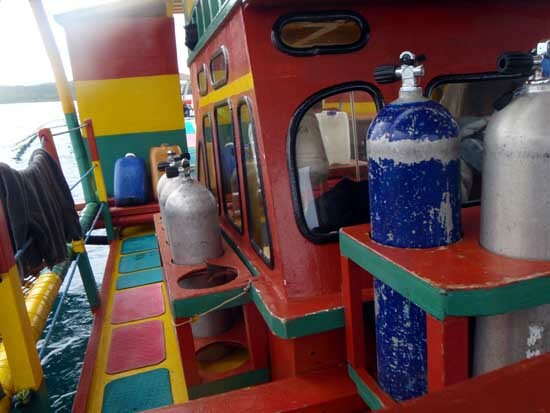 We can only do so much in one dive, but to anyone obsessed with wreck diving, you could spend several dives just exploring the inner sanctum of this ship. Lastly, I saw a huge cuttlefish! 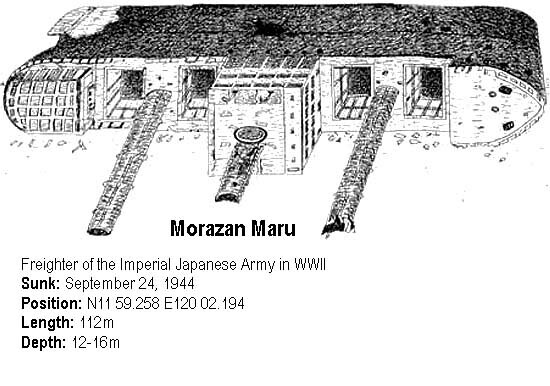 The Morazan Maru is a 112m Japanese freighter sunk in 1944 (I guess these wrecks were all sunk in one Allied air raid). It lies on its starboard side at 16m. This is ideal as a beginner wreck as it's not too deep and you can dive through its entire lenth with huge boiler rooms giving you a lot of space. Again, being inside a wreck is a ghoulish experience. It felt like trespassing an eerie graveyard. Throughout the dive, I saw teeming marine life - scorpion fish, stingrays, and as a surprise, a huge lobster in its full form. Usually, in a reef, I only see the protruding antennae of a lobster as it hides inside a rock. Here, it entered a porthole thinking it was another rock. But once inside, there was no place to conceal itself! There was a third wreck dive, but I opted to chillout. Beyond 2 dives, it feels like stretching it. 2 is good enough. I couldn't forget the conversation I had with a German couple on the boat. They sold everything they had in Germany to travel for an entire year. I asked why they had to sell everything. They said, "It's the only way we could be free." WOW! I've done 3 wreck dives to date - and it only whet my appetite for wreck diving! 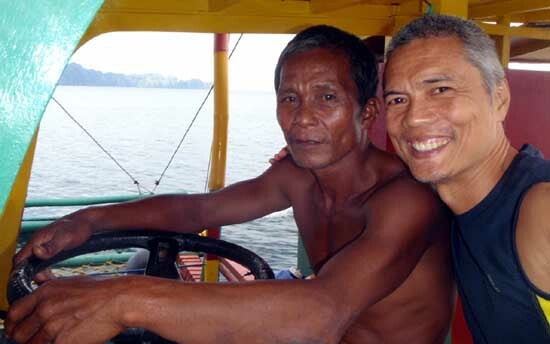 Next time I visit Coron, I'll try more wrecks until I muster enough sinew to dive the dreaded Irako Maru - they call this the DDD - deep, dark and dangerous! ps - wishlist? just one. I hope the staff didn't smoke while on the job. It's annoying to non-smokers (like me). 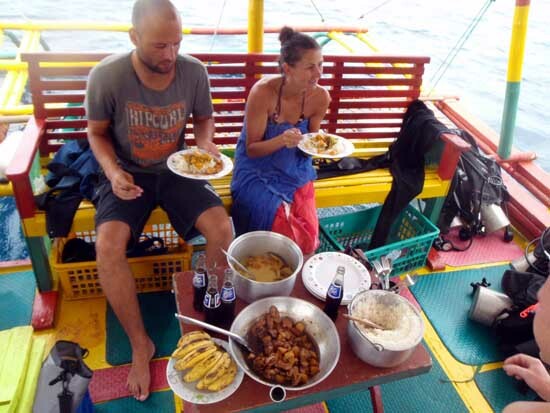 disclosure: Rocksteady Dive Center became clients after my initial talks with Gerd and Karin. This blog is not a lip-service for them. I just say it like it is.